On December 18, 2017, the world lost Kim Jonghyun, the main vocal of K-pop group Shinee, singer, songwriter, producer and artist. Devastated, distraught and searching for comfort, fans began immediately paying tribute to the man, bringing flowers, gifts and endless notes to SMTown at Coex. The makeshift memorial was soon overflowing, post-its wallpapering the outside of the building, and a garden blooming on the concrete in memory of a man who had meant so much to so many. However, after the memorial was repeatedly vandalized and disturbed by pedestrians and the homeless in search of food, fans set up boxes to discourage rifling through the gifts left. The memorial was quickly outgrowing the space co-opted outside, and SM Entertainment soon after announced plans for an official memorial inside the SMTown Coex Artium. 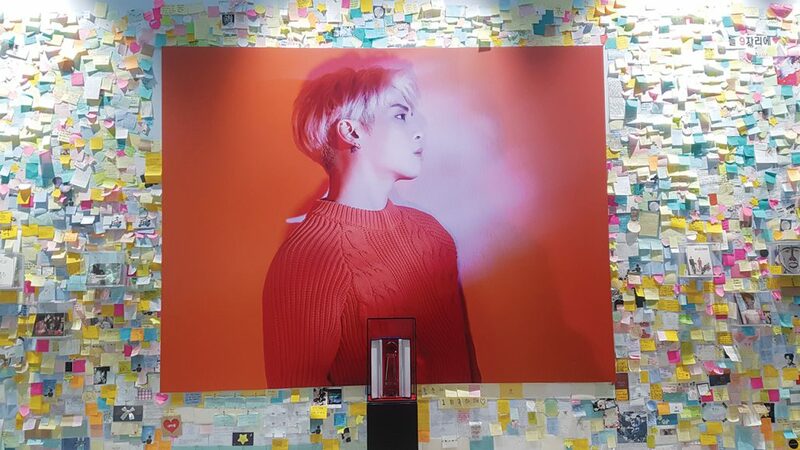 While SM may have provided the space and the large portraits, excerpts from his book, the clear album cases, and even the famous kazoo and handbells from his concerts, it was Jonghyun and Shinee’s fans who truly made the memorial. Much like the original outside, the memorial is peppered with colorful post-it notes and letters. It’s an endless kaleidoscope sea of thank yous and personal tributes. The walls are awash with the notes from fans, and every day more are added to what little space remains on the walls. “I pretty much go once a week and write a sticky note,” says Carolyn, an American Shawol (the name for Shinee’s fans) who has been living in Seoul coming up on four years. However both girls agree that the space is well done, SM handled it well, and it serves an important purpose for fans who want to visit. The current memorial is only temporary, with concerns from some fans that a permanent memorial won’t be made available. While there are rumors, nothing official has been stated one way or the other by SM. The centerpiece of the memorial is relatively small in size, but its importance cannot be overstated. Encased in glass is a first place “Music Bank” trophy, awarded to “Shinin’,” a title track on the last album Jonghyun recorded. Released at the end of January, Jonghyun’s “Poet | Artist” has been celebrated by fans and the media at large for its musicality, artistry and pep that was so uniquely him. There was little doubt it would hit number one on the charts, but his posthumous wins on music shows present a bittersweet validation for fans. He had asked to be told one thing, and now everyone was doing exactly that. Jonghyun’s memorial is open from 10 a.m.–9 p.m. on the sixth floor of the SMTown Coex Artium until April 30. If you or someone you know needs to talk to someone, please don’t hesitate to seek help and reach out at www.lifeline.or.kr or call 1577-0199.